COACHING STAFF: Mark Hardy named assistant coach; Jamie Kompon, Nelson Emerson and Bill Ranford round out coaching staff; Mike Johnston offered position with team; Dave Lewis will not return. EL SEGUNDO, CA — On August 4, the Los Angeles Kings announced that they have hired former Kings player and Assistant Coach Mark Hardy for a second stint as Assistant Coach. They also announced that Jamie Kompon has been promoted to Assistant Coach and Nelson Emerson has also been promoted to Assistant Coach and Development Coordinator. Goaltending Coach Bill Ranford has also been retained. Associate Coach Mike Johnston will not return to the coaching staff, but has been offered a position to remain with the team, while Assistant Coach Dave Lewis will not return. Hardy, 49, was an Assistant Coach for the Chicago Blackhawks the last two seasons after his first stint as an Assistant Coach with the Kings from 1999-2006 under then-Head Coach Andy Murray and with interim head coach John Torchetti. Hardy’s work with Blackhawks defensemen resulted in the team’s goals-against average dropping from 3.40 in 2005-06 to 2.82 in 2007-08. Hardy played fifteen years in the National Hockey League, including two stints with the Kings (1979-88 and 1992-94). He ranks 16th on the Kings all-time scoring list and is ranked third on the Kings all-time defensemen scoring list with 53 goals and 250 assists for 303 points in 616 regular season games over eleven seasons with the Kings. Hardy also played in 41 career playoff games with the Kings, scoring five goals with ten assists for fifteen points and 64 penalty minutes. He was a member of the Kings team that advanced to the Stanley Cup Finals in the 1992-93 season. In all, Hardy scored 62 goals and added 306 assists for 368 points with 1,293 penalty minutes in 915 career regular season games with the Kings, Minnesota North Stars and New York Rangers. In 67 playoff games, Hardy scored five goals with sixteen assists for 21 points with 158 penalty minutes. With the Kings, he was twice named the Kings Outstanding Defenseman (1984-85 and 1986-87). In addition, he ranks second in assists (250), third in games played (616), fourth in penalty minutes (858) and fifth in goals (53) amongst Kings defensemen all-time. Hardy was selected by the Kings in the second round (30th overall) in the 1979 NHL Entry Draft. Kompon, 40, has served the past two seasons as Assistant Coach and Director of Player Development. Prior to joining the Kings, he spent nine seasons with the St. Louis Blues organization (1997-06) as the club’s Video Coach before adding Strength and Conditioning Coach to his title during the 2002-03 season. Emerson, 40 has served as an Assistant Coach with the Kings for the last two seasons. Justin Azevedo: Too Small For The NHL? Is there any talk of needing upgrades in manchester? I know nothing of the coach, but 1 round playoff sweep victim isn’t too good for morale of the youngsters. Any chance McSorley could ever be brought back into the Kings organization in a coaching role? From what I hear, he’s still super competitive and passionate about the game. I’d like to see him given a chance, possibly in manchester first. The Monarchs had a very, very young team last season. And as you’re probably aware, minor league teams are at the mercy of their parent club in terms of player personnel, which can change on a dime. Mark Morris seems to be a fine AHL coach. Gann, we’re depending on these young guys in the NHL this year. No disrespect to Morris, but shouldn’t AEG demand results in Manchester if they’re gonna sell the fans excitement for the coming of the youth? Results in the AHL are fleeting, at best, because of the high turn-around on the roster. Generally speaking, based on what I’ve seen, the AHL clubs that win a lot are older teams with a lot of career minor leaguers and former NHL players who can’t cut it at the NHL level, but still want to play. What’s most important is how the prospects down on the farm are developing. Yeah, winning helps, but it probably isn’t the most important thing. I see your point gann, but it’s also good to go deep in the playoffs at any level. I’m sure it’s tough, though, when the team has players moving back and forth between the NHL and AHL. I remember years back when the Gulls in San Diego were the cream of the IHL crop, but unaffiliated with any NHL team that I can remember. It sure would ease my doubts about this year if the Monarchs had powered deep into the AHL postseason, however. Cheers. by the way, gann. Is there a way i could contact you by email outside of this public domain? I had a question for you about your blog. No doubt. But can you imagine how frustrating it must be for both fans and team officials with all the player movement when you’re trying to win something? Sure. 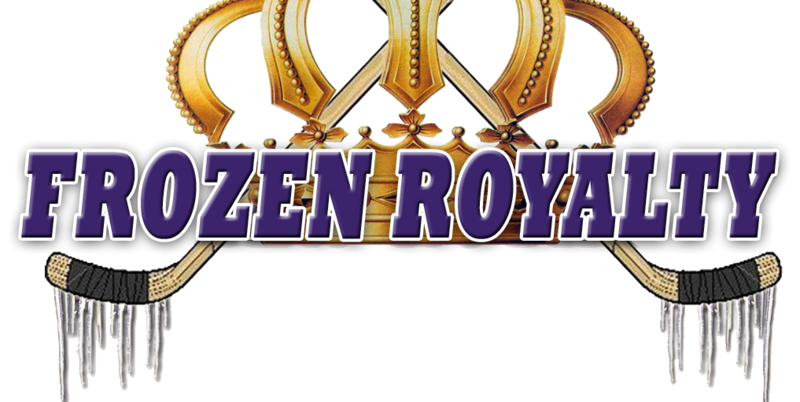 Click on the About Frozen Royalty link at the top of the page.